Free shipping and returns on our model 32 bender to the UK. The SIMA DEL 32 easily bends flat and reinforced steel rebar to any angle you may need in construction, up to 32 mm in diameter. Assembled with a new compact motor-reducer fitted with heat-tempered and rectified gears, no belt transmission and therefore low maintenance: (oil to be changed every 6000 hours of operation). With precise angle adjustment through pins and inductive sensors, the SIMA DEL 32 rebar bender is dirt and water proof, and much more reliable than standard limit switches. It features lateral short rulers with holes for pins, allowing for accurate tuning on angle adjustment (models SIMA DEL 32 and SIMA DEL 36). Models DEL 45 and DEL 52 features lateral long rulers which allow double bends for "Z" shaped figures (bottle neck shapes). Two motor speeds are available upon request on rebar bender models DEL 32, DEL 36 and DEL 45. Optional accessories for spiral bending, stirrups, and other functions are also available for the model 32 rebar bender. Our combination cutter-bender COMBI machines have the same production and bending capacities as our DEL range of rebar benders. They are also featured the same electrical and mechanical safety devices as DEL machines, and their electric components are from such top-quality suppliers of worldwide renown as Schneider-Electric. The cast-iron shear body and gearbox case ensure heavy duty performance and endurance with the lowest possible maintenance. Machines feature an oil bath, as well as trapezoidal and helicoidal gears. 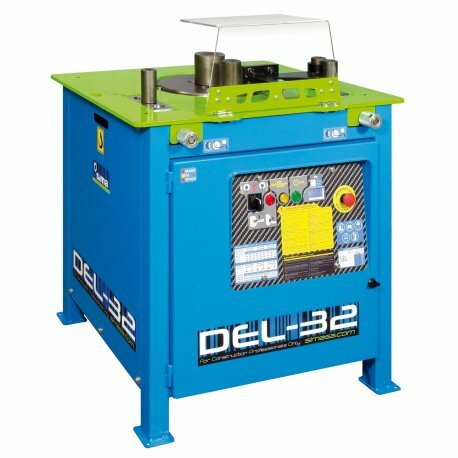 For operator safety, safety shield with a limit switch on the shear body and bending table is included. Easy and low-cost maintenance can be even performed on site by the machine operator. A single-phase 220V version with inverter technology is available for model COMBI 25/32. The inverter stabilizes the electric supply, resulting in an increased motor life. Two motor speeds are available upon request on models COMBI 25/32 and COMBI 30/36.